In our Hertfordshire yard and showroom we stock a rich and ever changing variety of Reclaimed Timbers and are forever looking to ethically source more beautifully aged wood. Our skilled workforce are ready to help you with everything from finding those matching Victorian Floorboards (and laying them if you wish), designing and crafting a Welsh Dresser or (any size) Farmhouse Table to a Full Listed Building Design and Renovation Service. Whether you are looking to simply shop for that special piece or looking for a Complete Design, Supply & Build Service please do not hesitate to ASK US - we will enjoy your challenge. 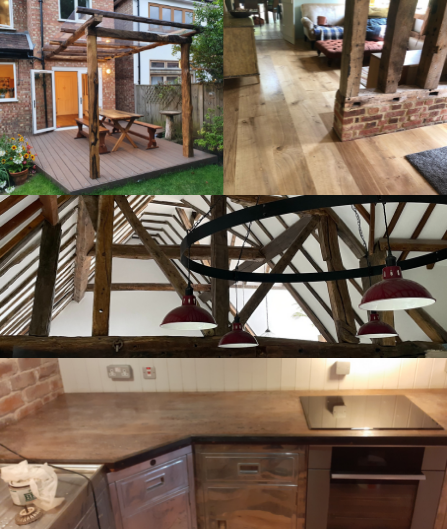 Our skilled team will work on your choice of ethically sourced reclaimed heritage timbers to provide you with the most Beautiful Antique Flooring from a fascinating range of character wood including Vintage Pine Boards, Wide Board English Oak and Intricate Parquet Designs. We will fashion our reclaimed wood into a piece of furniture to your exact specification. Whether for a solid oak kitchen, painted pine dresser, built-in wardrobe, table or bench or a special look to your summerhouse – or even to furnish your entire medieval castle! You may also wish to enlist the amazing talents of our in–house artist, Zoe Calvert whose magical mastery of brush and paint can reproduce an amazing wealth of styles. (As of 2019) our friends at "Bespoke Green Tables" will deliver your own table design crafted from a choice of beautiful recycled timbers. We have proven specialist skills in the sympathetic renovation of listed buildings. Using materials that comply with local authority regulations we will deliver a complete quality service to your projects of all shapes and sizes. Whether for a whole wall (or floor or ceiling) or a single 'funky focal point', we can help fulfil your design projects - be they a relatively small area on your lounge wall or a complete film set! See examples of Devon Sea Groyne and McVitie's Factory Maple. Reclaimed stone, cobbles, bricks and timber & decorative artifacts can work wonders (at great value) in a garden landscaping project when character and a unique personality are required. Such an architectural investment can seamlessly match your driveway with an old listed outbuilding, or a contemporary swimming pool with its surrounds perhaps offset against some beautiful old York stone or an horrific granite gargoyle. Whatever you have in mind we can turn your vision into a reality. Our stock is constantly changing. We source timber and architectural items from all around Europe and in many different forms including Grand Union Canal LockGates, Sea Walls, Victorian Schoolhouses and special items such as Shepherds Huts, Bell Towers and antique Belgian Railway Carriages! Our craftsmen take great pleasure in sensitively reclaiming (for you) the rich architectural legacy gifted by previous generations.